(Most of the pictures on this page were taken by Alan Basinet aka "Marblealan" when he sold some of them for me several years ago. 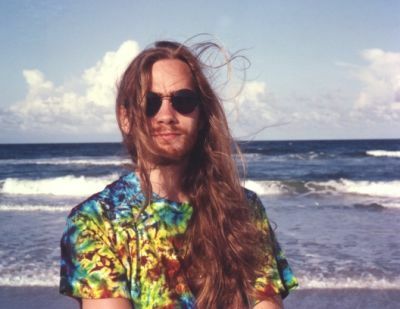 As most of you probably know, Alan died in 2012 at the age of 48. I am sure he would be happy to know that his pictures are shown here in his memory). 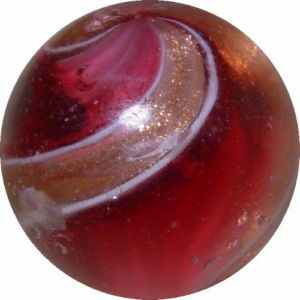 Every glass marble that has traces of gold glitter in, belongs to the family of "Lutz"-mables. Actually the name is completely wrong. 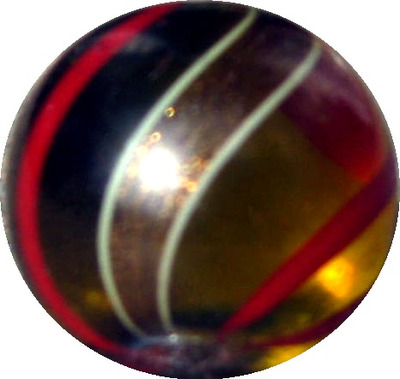 They are named after a man called "Nicholas Lutz", a glass blower from France who immigrated to the US in the late 19th century and worked for a glass factory in Massachussets. 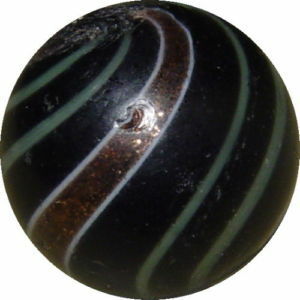 One of the earliest marble books falsely named him as the maker of these "Lutz" marbles and the name has stuck, although there is now clear evidence that these marbles were only ever made in German furnaces. Jede Glasmurmel, die Goldglitzer in sich trägt, gehört zu den Lutz Murmeln. Der Name ist im Prinzip völlig falsch. Unfreiwilliger Namensgeber ist ein gewisser "Nicholas Lutz", ein in die USA emigrierter französischer Glaskünstler, der gegen Ende des 19. Jahrhunderts in einer Glasfabrik in Massachussets gearbeitet hat. Ihm wurde in einem der ersten Bücher über Murmeln fälschlicherweise die Herstellung dieser Murmeln angedichtet und so kam es, dass dieser Typ von Murmeln bis heute den Namen "Lutz" trägt. Er ist mittlerweile nicht mehr wegzudenken. In der Zwischenzeit konnte aber klar belegt werden, dass auch diese Murmeln aus Thüringer Oefen stammen. 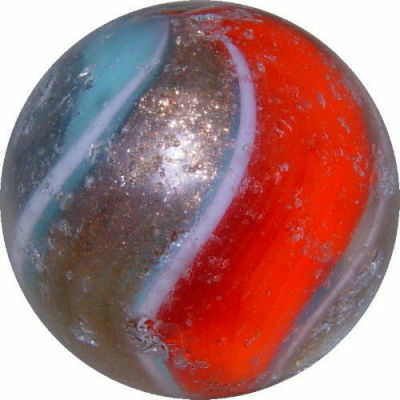 "Lutz" marbles can be divided in 6 categories. Usually they are quite small, between 5/8 and 7/8 inches. 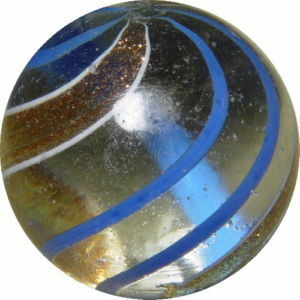 Larger marbles, especially examples in the area of 2 inches, are extremely rare and expensive. 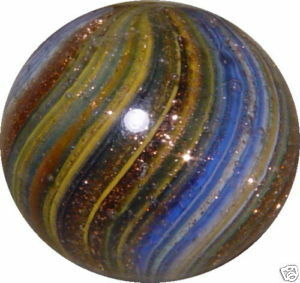 "Lutz" marbles are very pupular among collectors because of their noble appearance. Lutz Murmeln werden in sechs Kategorien unterteilt. In der Regel sind die Murmeln ziemlich klein, so +/- 18mm im Durchmesser. Es existieren zwar auch Lutz-Murmeln, die 50mm und mehr messen, die sind aber extrem selten ! Lutz Murmeln sind wegen ihres edlen Aussehens ziemlich begehrt unter Sammlern. 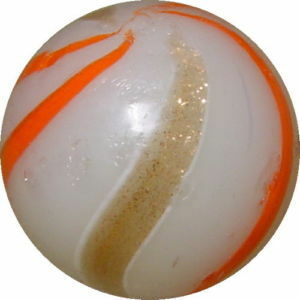 This is the most common type of "Lutz" marbles (and the least attractive one...). 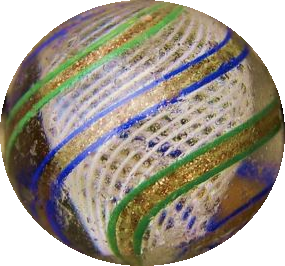 A clear marble with two broad bands of lutz embedded in two narrow white bands and 4 narrow bands of another color (lilac, yellow, green, baby blue, blue or red). This type is definately more attractive. 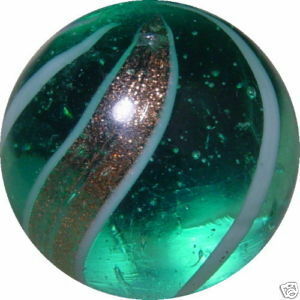 The style is the same as above but the marble is made out of colored glass (green, amber, aqua or dark blue). Usually the other bands are just white but sometimes you will find "colored banded Lutz"-mables with other colored bands too (like the example with red bands). This is the 3rd category of the same style. 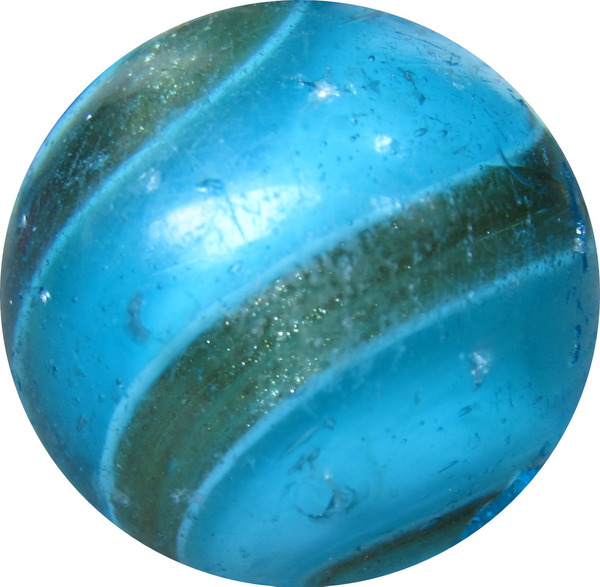 These marbles are opaque (or at least semi-opaque). 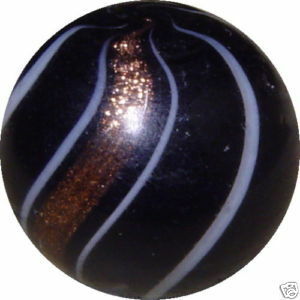 The most common base colors are black and white but you can find them in several other colors too (if you do you are lucky because they are quite valuable). 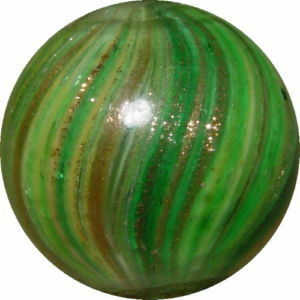 These are extremely beautiful marbles ! A normal onionskin is already quite attractive but with added lutz it is just breathtaking, especially when the marble is exposed to light or sunshine ! 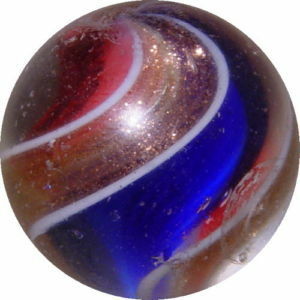 Marbles over 1 inch are very rare and expensive ! 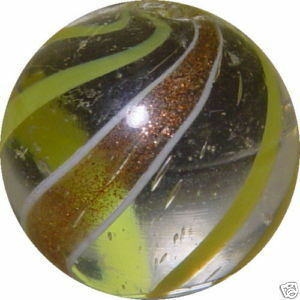 This type has no base color, the "Lutz" is directly in the colored glass (usually green or black). 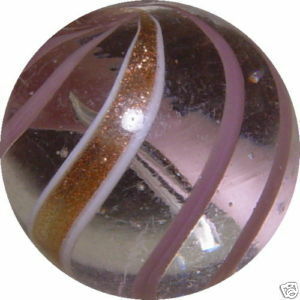 This makes the whole marble glitter gold when exposed to light. 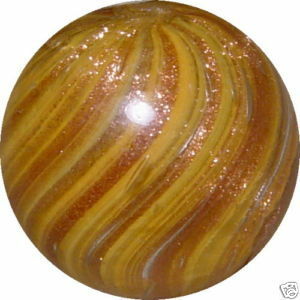 This is my favourite type of "Lutz" marbles. 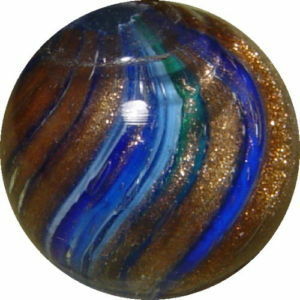 Marbles over 1 inch are very rare. 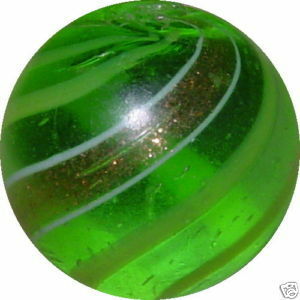 Bei diesem Typ wurde das Gold direkt auf das meist grüne oder schwarze transparente Glas der Murmel appliziert. Dies führt dazu, dass die ganze Murmel golden schimmert. Für mich persönlich sind dies die schönsten Lutz-Murmeln. Last but not least the "Ribbon"-Lutz. 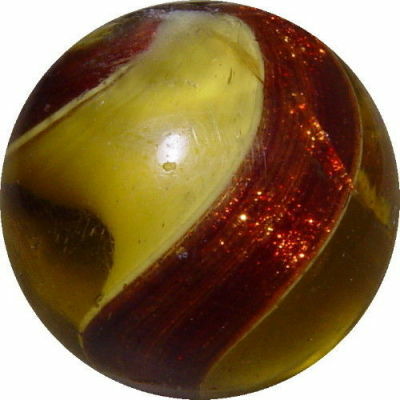 These marbles have two bands (usually two different colors but just one color is also quite common), separated by two broad "Lutz" bands which are embedded in two narrow white bands. 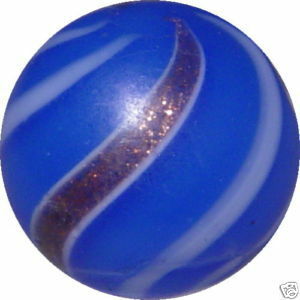 These marbles are very attractive too. 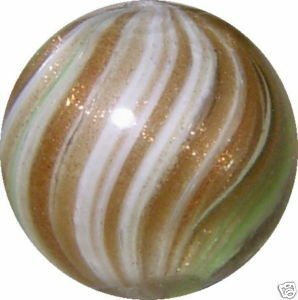 Examples over 1 inch are very rare and valuable ! Diese Murmeln bestehen aus zwei meist verschiedenfarbigen gedrehten Bändern, die von je einem breiten Streifen aus Lutz (gesäumt von weissen Rändern) voneinander getrennt sind. Auch diese Murmeln sind sehr attraktiv. 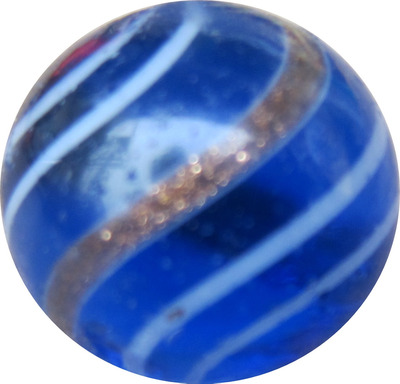 These are the 6 main categories of "Lutz" marbles. 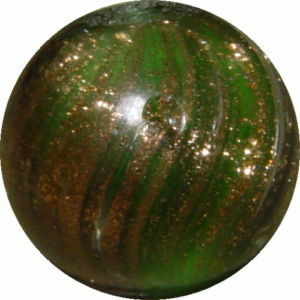 But there are somethimes also other types of marbles which have been enriched with "Lutz". Most of these are unique and therefore very rare of course. 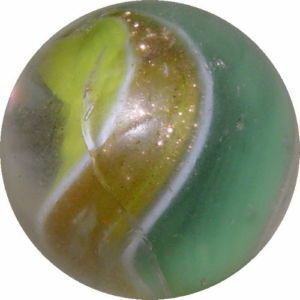 This beautiful example is a Latticinio Core with outer "Lutz" bands, a very unusual marble ! Dies sind die 6 Hauptkategorien der Lutz-Murmeln. 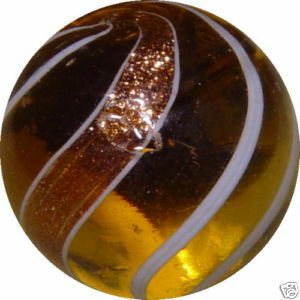 Es tauchen aber immer mal wieder auch andere Murmelarten auf, die mit Goldglitzer veredelt wurden. Dabei handelt es sich aber um seltene Einzelexemplare. Diese schöne Beispiel zeigt eine Latticinio Core Murmel mit äusseren "Lutz" Bändern.